I had planned this cruise for seven months. A friend and I who had previously cruised with Carnival and Celebrity were eager to try Royal Caribbean after hearing so many positive things about the beauty of the ship, quality of food and service, etc. For the second time, I surprised my retired parents by taking them with us (the previous year I had surprised them with an Alaskan cruise which I will review later), and they were absolutely giddy with excitement when they found out that they would once again be traveling aboard Royal Caribbean's Navigator of the Seas, which they claimed was their favorite ship of 13 other cruises they had taken. With the ship fresh out of dry dock for upgrades, were set to go to some brand-new destinations none of us had ever visited: Roatan Island, Honduras and Belize City. Expectations were high. Then cruise time came. While I am not prepared to say that we had a BAD time on this cruise, I think it is fair to say that our expectations were a bit deflated, pretty much from the minute we arrived at the Port of Galveston. Allow me to take you through the high and low lights of life on the high seas aboard Navigator of the Seas. Our dining experience-- Most definitely the best service we received on the ship was in the main Sapphire Dining Room, which is without a doubt the most gorgeous dining room I have seen on a cruise ship. Walking into the dining room is like entering a regal opera house complete with grand stair case and three levels of dining with windows on each side. Our two servers were extremely attentive, noting my step-mother's preference of making her own ice tea with two glasses of ice, 2 tea bags and some hot water, which was waiting for her every night after night one. I could fault her for being a "tea snob," but then I'd have to look at myself in the mirror with my Starbucks in hand turning my nose up at Folgers. All of us enjoyed the variety of meal choices and thought the food was of very high quality, with service running like clock work. It was truly a pleasure to dine each evening. Here we are at dinner. I am the goof-ball in blue. The Cabin-- Inside cabin 7667 (Aft Port) was home sweet home for our week at sea. My parents were right next door in 7669. For an inside cabin, there was plenty of room to stow all of our stuff and have a completely clear space to move in. I would say the bed was a bit hard, but it's all about your preference as my friend and traveling partner Jay (the guy in purple) said his was just right. Ample closet and drawer space allowed us to each have sufficient space to unpack. Our steward service was also top-notch, re-stocking and tidying up twice daily. The ship-- Navigator is definitely a beautiful ship. Of note is the Royal Promenade, a series of shops, restaurants and bars running aft to forward giving cruisers the feel of strolling down a cobblestone street while at sea. I recommend the Two Poets Pub for some nice ambiance and people-watching. The main atrium is gorgeous, and the various lounges and bars are designed with a very classy yet comfortable feel. The pool deck is also impressive, featuring two main pools flanked by several hot tubs, some of which are shaded. For the most part there are plenty of chairs both in and out of the shade, but if your cruise is full you had better get there early to snag one. We also thought the nightclub overlooking the pool deck with its floor-to-ceiling windows added a nice touch to the ship's offerings. The ship's casino is also pretty decent, but since smoking is allowed in there, you may come out smelling like an ash tray. Beverage Package--Three of us on this cruise had the premium package for $55 per day, but since my dad only drinks beer, we got him the basic package. At first glance, this package might seem a bit pricey (Royal Caribbean's beverage packages are some of the most expensive at sea), but overall we got our money's worth. What I especially liked was that basically nothing on the drink menu was off limits short of the super premium stuff. You could even opt for Grey Goose vodka at no extra charge. The flip side here is the bar service (see below). Theatre Entertainment--If you ever find yourself on Navigator of the Seas, don't miss the ice-skating show. It is fantastic and was much better than I thought it was going to be. We also enjoyed the Elton John impersonator, the bar flair show and the adult game show. Embarkation/Debarkation--The words fiasco, nightmare, eternity and disorganization come to mind for both. This was hands-down the WORST embarkation/debarkation process I have ever experienced, and my parents who had been on 13 previous cruises agreed. We should have expected this when Royal Caribbean sent us out an e-mail prior to the cruise instructing us to arrive at certain times based on the deck on which our cabin was located. As it happened, we had flown into Houston, and our transfer dropped us off right at the time we were supposed to be there, which was 12:30 p.m. We did not step foot on the ship until almost 2 p.m, as we were stuck two different lines, both of which were extremely slow-moving. This is definitely not the way you want to start your vacation, and very few smiles were to be found in the security and check-in lines. Mind you, I totally expect a bit of a wait checking in, but this was just ridiculous. I think the longest wait I have ever experienced prior to this was 30 minutes tops. I definitely expressed my dissatisfaction to the check-in lady. Debarkation was practically just as bad. Since we had a driver waiting for us, we opted for the self check-out and were given a specific time and place to meet. We have done this on other cruises with minimal waiting, with customs officers boarding the ship to collect forms. In the past, we have basically just walked off the ship. Not this time. When we arrived at the appointed spot we then waited another good 45 minutes just to be allowed to disembark. Once off the ship, guess what? Another line, another 45 minutes to pass through customs. I ended up being a charged an additional wait fee by my driver, thanks to Royal Caribbean and the Port of Galveston. Bottom line--I will never cruise from Galveston, Texas again as they clearly do not have the ability to handle the volume of people that cruise ships have. 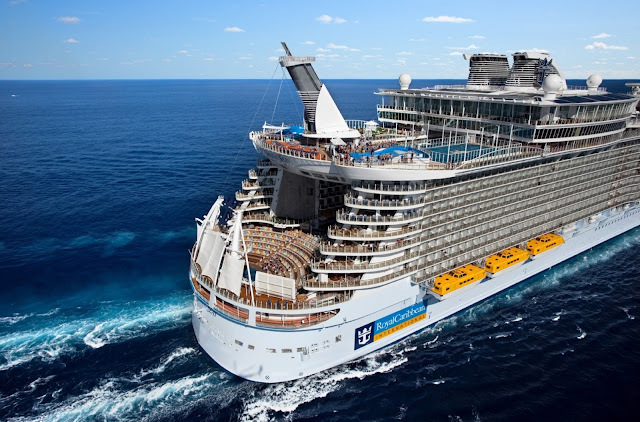 Basically, Royal Caribbean left a negative first impression and a negative last impression. Service--Aside from our servers at dinner, service in the bars and lounges on this ship was average at best and certainly not what I am accustomed to on a cruise. While some bartenders were standouts, it generally took forever to get a drink and often you felt as if you were a bother to the bartender or server. The worst service was probably at the pool bar. Some might say that I am too demanding, but when I spend my hard-earned money on vacation I want decent service. Period. I didn't really get it on this cruise. My parents also commented that "things just weren't the same on this cruise" as their previous experience on Navigator of the Seas. Kids, kids, kids-- OK, I am probably going to get some eye-rolls for this, and maybe for some it wouldn't be a negative, but there were just too many kids taking over the main pool area on this ship. As with anyplace else, parents are partially to blame here, allowing their little monsters to run amuck and splash others in the main pool, but I fault Royal Caribbean for not enforcing pool rules. On past cruises, kids weren't even allowed in hot tubs, but they were in this one. Granted, there is an adults-only pool and hot tub, but the problem is that there isn't any entertainment there (not that the entertainment at the main pool was anything to write home about). We did not participate in any excursions on this cruise, so I can't speak to their quality. We did hear various comments that the excursions were over-priced and not worth the money. One excursion was even over an hour late and had to be delivered to the ship by boat as it was departing Honduras. The verdict--If I had to choose between Royal Caribbean and Carnival, I would probably go with Carnival based on past experiences. I am not totally closed to giving Royal Caribbean another chance, but they would have to completely WOW me to keep me coming back.